Hello, my friends. I've gotten your emails and yes, I'm still here. Ready for an update? Matteo arrived in China and is navigating through 3rd world challenges in a part of the country where no one, aside from the two other people on the music faculty that he is teamed with, speaks English. But this kid of ours has such an adventuresome spirit that he's doing it all with a smile (and red sunglasses) on his face. 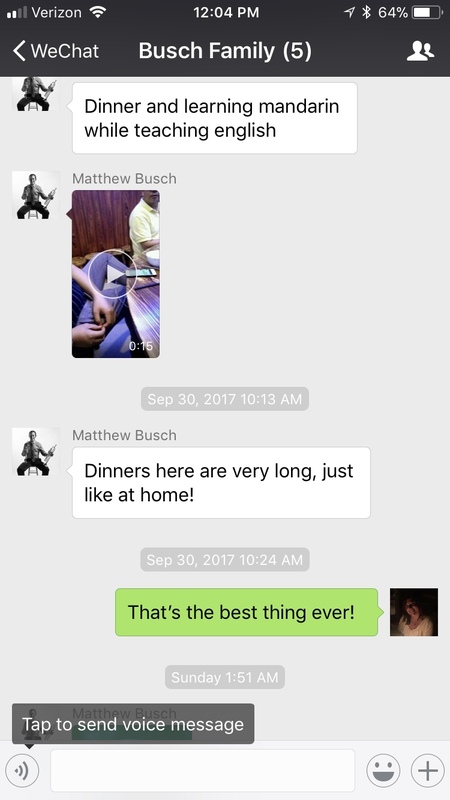 We've got a great app that we are using and have a fun family chat going at all hours of the day and night...because hello, there's a 15 hour time difference. Thankfully we can text and call and send videos and while I have always had a love/hate relationship with technology, I currently love love love it. But China, my friends, is far away. And when your boy texts all his life stuff...things like passport issues and work permit issues and he tells you about flights to not close at all cities where he lands and then has to take an hour-long taxi ride to the embassy that my oh my, being the mama of an expat is hard. But it's also good. Alex has moved, too, and yowza, do I miss him. He's bigger than life and while quiet, you always know when he's around because he's...hmmmm, how do I say this nicely? Alex is a slob. Like a full-on Pig Pen from Charlie Brown. So while I miss his wit and humor and funny comments, I do not miss his stuff being everywhere he's been. From socks to dishes to water bottles to ripped open mail...he could keep a full-time housekeeper busy day and night. But he is so happy and that is infectious to be around. I had to travel to Florida for work and was able to squeeze in an Italian dinner with my favorite Italians. These trips are so busy and so packed full and work feels so very very hard right now that this was a beautiful respite. I'm finding that I'm struggling with my attitude...with finding the joy in day to day life because I'm, well, feeling sorry for myself and mourning what was and knowing full well that I need to let all that go and begin living the gift that I've been given today. And so every day I remind myself and as of this week, I'm usually able to make it to 8:00am before I start grumbling. Ah well...it's a process. But a quick visit with my family who I love so much was a blessing. I flew home in time to gather with some of my favorite people on the planet at Oktoberfest in Anaheim. I look forward to this all year and it's just so. much. fun. We (as in my boy and our friend) built a tall tower of cups and we all danced the chicken dance and drank great German beer and laughed and talked and I just kept hugging all my peeps. But whoa...it's not cheap. But then again, nothing is. I really love this kid. And if you want a taste of real life, and of my real life personality...well, here's me having it out with security. I mean COME ON - why can't we dance on the tables???? Though at this point I think I was inviting him and his whole family to dinner, because that's how I roll. Our little house on our little street is clean more often than not because it's no longer a houseful of boys...but rather a houseful of pets. Might have to change the blog name, except there still seems to be a lot of boys in and out. That guy that I like so much has been working all sorts of crazy long hours because as Lutherans, this is a big anniversary year...and because of that there seems to be event after event followed by a huge concert on November 1st. But then we had an afternoon where we escaped reality and headed for the happiest place on earth for a few hours. The weather was beautiful and it was exactly what we needed...though I think, sadly, this will be our last year of passes for a while. You know, the whole boy in college and it's just not easy thing...and we've gotta be responsible adults. This past Friday night we filled the garden with friends and then on Saturday morning we had coffee with Matthew while he told us all the news in his part of the world. Things like the fact that there are no western toilets anywhere (yikes) and that they found oreos in a nearby town (green tea flavored) and that he's comfortable enough now to get out of a taxi if they won't give him the price he wants. Brian (and his dad) had a concert Saturday night and Sunday was a church visit for that guy that I like so much followed by a huge afternoon rehearsal. But then Emily and Alex came for supper and I cooked a prime rib that I found in the back of the outside freezer, complete with twice baked potatoes and a big salad. It felt like a weekend, even though it was so busy. I had a moment today...a moment where I was taking communion at church and the choir was singing 'ubi caritas' and it sounded - and felt like heaven. Like there was no noise...just this warm peace that enveloped me. Like God himself was hugging me and in that moment, nothing else mattered. The tears came and I didn't want to move...I didn't want to leave that sacred space. I can't explain it but it was bigger than me and oh, how I needed that reminder of how big, and in control, my God is. I'm holding on to that as the week begins.